Happy Cinco De Mayo! This month my recipe for Portobello Asada Tacos was featured in my friend Fabio Viviani‘s magazine! I hope you enjoy! Where’s the beef? Who cares! 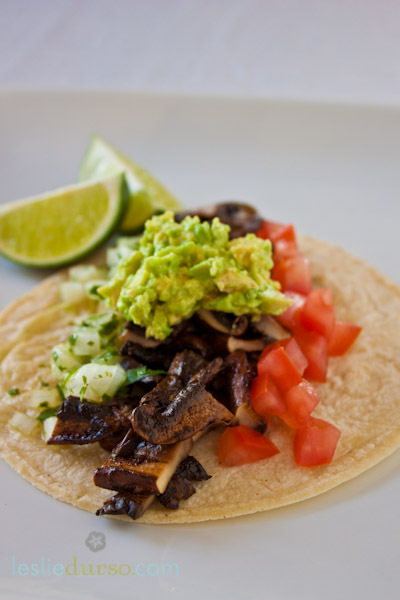 My vegan take on carne asada will have you questioning the need for carne at all. Growing up in San Diego meant round-the-clock access to the most amazing Mexican food this side of the border. Eating at taco shops at 2 am is just about a right of passage for any San Diegan. I love the flavors and concepts of authentic Mexican cuisine, but I couldn’t find too many vegan options on the menus so I started creating my own at home. From chile relleno and enchiladas to tortas and chimichangas, I’ve veganized them all! Here’s one of Mexico’s most famous staples: carne asada. My vegan version replaces traditional beef with portobello mushrooms, which I marinate in citrus and spices overnight. The end result is Mexican food that packs a flavor punch without the late night 2am guilt. Whisk together all the ingredients except mushrooms in a large bowl. Add the sliced mushrooms and toss to coat. Pour the mushrooms and marinade into a airtight plastic bag and refrigerate for 4 hours (or overnight). In a large frying pan, on medium heat, add the mushroom and marinade and saute until the mushrooms are tender, about 10 minutes. Remove the mushrooms from the pan and cut into 1 inch pieces. Combine all the ingredients together in a bowl and refrigerate.Serve with warm tortillas, Onion Cilantro Relish, and Guacamole. I’m a bit confused…..ingredients call for 4 portobello cut into 1/2″ pieces. Then after marinating and sauteing it says to remove the mushrooms from the pan and cut them 1″ pieces. Do you mean 1/2″ slices, and then into the 1″ pieces? I haven’t had anything asada since I gave up beef 7 years ago, so really looking forward to the flavors… The recipe sounds great. Do you know if Its possible to make extra and freeze? Unfortunately, mushrooms do not freeze very well.